It was a fairy tale ending for Crankt Protein Honda Racing Team’s Troy Herfoss at Round 2 of the Yamaha Motor Finance Australian Superbike Championship at Wakefield Park today, collecting the round win in front of family and friends. However, it was a hard fought battle to the overall Yamaha Motorcycle Insurance Superbike podium, with plenty of thrill and spills across the two races at Wakefield Park today. When the bikes headed to the track for race one this morning, a packed Superbike media grid put a certain buzz in the air before racing had even gotten started, and by the time the Superbikes set off for their warm up lap, fans watched on, eager to see the battles unfold. Despite Herfoss starting on pole, the lightening fast Yamaha machine of Glenn Allerton managed to make his way in to the race lead, followed by Crankt Protein Honda Racing fill in rider Anthony West who found his way in to second. After only two laps, the Superbikes were forced to return to the grid – the opening race being red flagged when three riders went down in lap ten. And thankfully for Honda mounted Herfoss who got to a terrible start initially, a complete race restart was ordered, with the race reduced to 14 laps. When bikes took off for the second time, Herfoss took full advantage of the restart, taking the early lead through turn one, followed by Allerton, and teammate Maxwell who were locked in to a head to head battle for second position. Just as racing got underway again, there was an unbelievable repeat of events, with the race red flagged for a second time – two riders going down in turn ten, forcing the Superbike race to restarted for a second time. With the Superbike race reduced to 12 laps, when riders got to a frustrating third start, Herfoss launched off the grid first yet again, but before riders had gotten the opportunity to get one lap in the books, the race was once again red flagged, with DesmoSport Ducati’s Mike Jones, West and Halliday caught up in a crash at turn one. As a result, the further restart of race one was rescheduled to after lunch. When the Superbike race one finally got underway at 2:00pm, Herfoss got the started he’d hoped for, but despite leading for a lap, Allerton executed an outstanding pass on lap two, moving in to the race lead with time on his hands. After two laps, the running order saw Allerton out in front, followed by the Honda pair, Herfoss and West who were locked into a battle for second. It was the five lap freight train of Allerton, Herfoss, West, Halliday and Maxwell that kept fans on the edge of their seats, Allerton even setting a new lap record with a 57:860, proving he was the man to beat. However, with the Superbike race one shortened to 12 laps, riders had limited time to get their battles for top positions sorted out, and as the race reached the half way point, Allerton and Herfoss began to pull a gap on Maxwell and West who were in a head to head battle for third. On turn five on lap seven however, it all went pair shaped for Yamaha’s Allerton who ran wide and hit the dirt, handing the race lead to Troy Herfoss ahead of Maxwell and West – Herfoss also managing to set a new lap record with a 57:540. But there was further disaster in store for the Yamaha stars, Maxwell also crashing out in the exact same turn on the following lap, allowing Crankt Protein Honda’s West to move in to second position, behind his new team mate Herfoss. With the Yamaha front runners both out of race win contention, when the last lap board was shown, it was Herfoss with the lead on home soil, ahead of West, Halliday, JD Racing’s Daniel Falzon and Ben Burke rounded out the top five. And by the time the chequered flag flew, no one could match the flawless performance of Goulburn local Herfoss, taking the race one win from West and Halliday who finished in second and third places respectively. The final top positions saw Burke in fifth, while 2015 Supersport Champion Brayden Elliot wrapped up race one in sixth. New Zealander Sloan Frost finished seventh, Ryan Hampton in eighth, while Adam Senior and Nathan Spiteri finished in ninth and tenth places respectively. When the Superbikes lined up for Race 2 this afternoon, there was a sense of excitement in the air, with the likes of Yamaha Racing Team’s Maxwell and Allerton eager to redeem themselves, while Herfoss attempted to remain undefeated. When the Superbikes screamed away for the final time today, Herfoss looked as if he had the jump that was required, however it was the Yamaha machine of Maxwell who got to the early race lead. 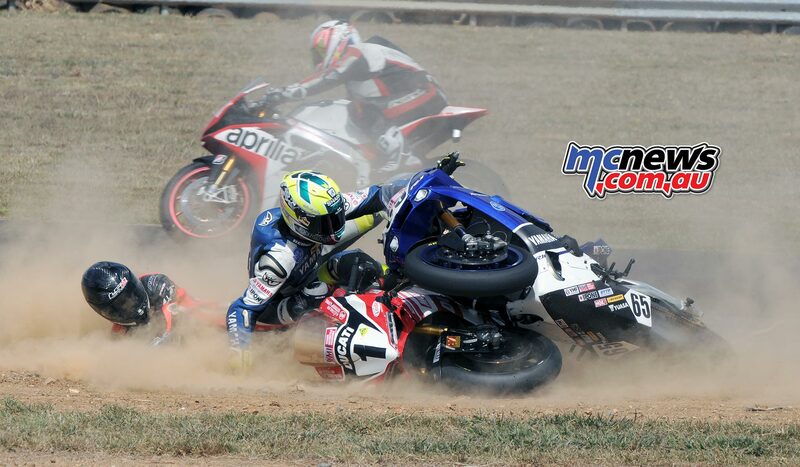 And there was carnage again in turn one, with Halliday and Falzon going down, both unable to resume the race. With two laps in the books, the focus then shifted to the front of the pack, and with Maxwell pulling a comfortable gap on the field, by lap three it was the fight for second between Allerton and West that had the crowd on their feet. By lap five, the running order saw Maxwell in front with a three second lead on second position which was held by West, followed by Allerton in third and Herfoss in fourth. Herfoss, who was determined to put on a performance in front of family and friends, then began his charge to the front, and by the time riders headed in to lap eight, the local had made the pass on Yamaha’s Allerton and began to eye off the rear tyre of his Honda teammate. In a huge upset for Jones this afternoon, the defending ASBK champ was forced to return to the pits after only nine laps with a mechanical issue. For Herfoss though, a pass on West during lap ten provided a clear track ahead for the local to chase down Maxwell. And chase down he did, the local taking advantage of Maxwell heading in to lapped traffic – managing to marginally close the gap. However, Herfoss’s charge to the front was put to a stop at turn ten on lap 13, with the local running his Honda machine wide, forcing him to drop two positions back in to fourth. With one lap remaining, Maxwell was completely untouchable, while Honda fill in rider West maintained an impressive second position, followed by Allerton in third, and Herfoss in fourth. When the chequered flag flew, there was no change in race order, Maxwell taking an unchallenged race two win, ahead of West and Yamaha teammate Allerton who crossed the line in third. Herfoss, and privateer Burke (Kawasaki) concluded the final race of the day in fourth and fifth places respectively. It was Elliot who held on for sixth in the final race of the day, followed by Sloan Frost, Ryan Hampton, Adam Senior, and Joel Beard rounding out the top ten. Despite a fourth place in race two, Honda mounted Herfoss did all that was required to take the Round two win on home soil, ahead of his team mate West who collected second in his first ASBK appearance since 1998, while the surprise performance came from Kawasaki mounted Bourke who secured third position on the Yamaha Motorcycle Insurance Superbike Podium. Herfoss who was relieved to have gotten the job done at his home track, shared his thoughts on his round two overall win, straight off the podium. “It was a bit of a mediocre final race for me, but I’m really happy to walk away with the round win. To come home to Goulburn and race in front of my mates and my family, get pole position, and then get the first race win is awesome,” he said. “It was a hectic day especially with all of the race restarts, so it was hard to keep going back to the grid, but it’s a fantastic reward for the Crankt Protein Honda Racing Team that I got the job done.